EasyKicks is the first sneaker club for kids that allows busy parents to order new Nike and Converse sneakers online when they need, starting at $20 per month. Orders are delivered to your door in a box personalized just for your child, along with fun stickers and other club features for members. This post is brought to you through a partnership with EasyKicks. All photos and opinons are mine and honest. 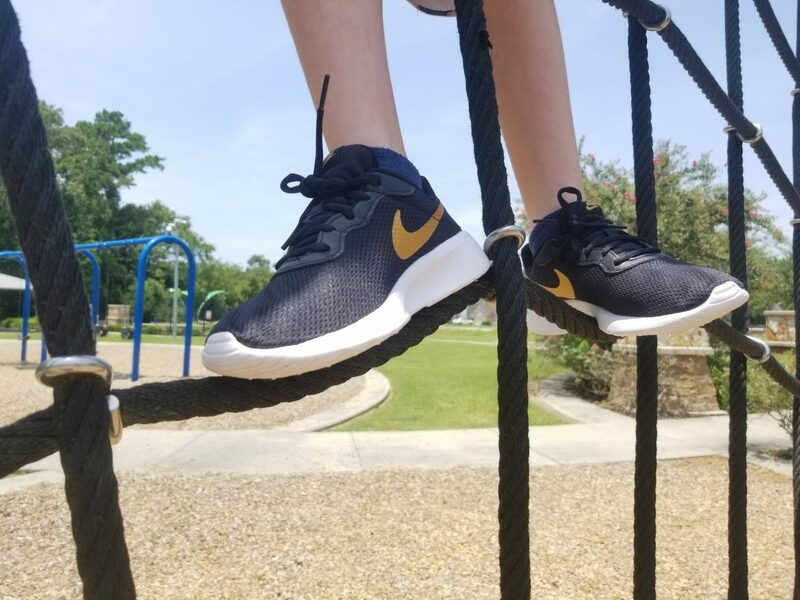 Kids can wear their EasyKicks shoes as long as they want to and when they are wrecked, too small, or they just want a new style, you place your new order and then send the old pair back in the prepaid shipping envelope where they are donated to EasyKicks nonprofit partners. There are so many options! EasyKicks ensures parents always have their kids in shoes that fit, delivered right to their door. No more crazy trips to the mall, no more buying shoes that kids wear a few times before they are wrecked or too small; EasyKicks gives you time back to spend as a family. EasyKicks offer the latest selection of Nike and Converse styles with options and sizes 4c – 7y. If you are not sure what size your child wears, they can help. What Size Should I Order? Just in time for back to school we were excited to get started. Little man has been wearing flip flops for 3 weeks because his shoes are too tight. We JUST bought those shoes! So it was time to get new shoes and I was waiting till closer to school time. So he was so excited when I said we could get new school shoes a little early! My little man was so excited to pick out his first pair! It is so perfect for us because he is at that stage where he is constantly growing. We bought his current shoes in April and a few weeks ago he said he couldn’t wear them because they are too tight and hurt. So he was thrilled to pick out new Nikes! Then the box arrived! It even had his name on it! Here is a closer look of what came in the box. Then it was time to put them to the test. We went out on an adventure! Browse shoes and select the shoe they want. You can pick from a fresh selection of new NIKE kicks. All EasyKicks memberships come with free shipping, personalized shipments, and free exchanges with no hidden fees. We also like to throw in cool things like EasyKicks collectible stickers, magnets, and other fun stuff kids love. This is NOT an on-demand subscription! You will not get a box every month! When you sign up, you’ll pick a pair to receive right away. Whenever you need to swap, just log in and pick a new pair to start the process. Once you sign up you will pay every month for each child member. But there are no other charges for swapping shoes, and shipping is free. EasyKicks returns were designed to be as convenient as possible. They include a prepaid return bag with every order to save you time. Whatever the case for your return (exchange, swap, or recycling/donation of old pairs) the process is the same. Simply place your used EasyKicks into the return bag and drop the bag off any of the following locations: Your own mailbox. Your mail carrier will pick it up, Any United States Postal Service (USPS) blue box, Any United States Postal Service (USPS) location, Any FedEx location. Find out more about how EasyKicks works and you when you are ready sign up online. There is a great video about EasyKicks here. Now is the perfect time as school is about to start. You will be able to replace the school shoes as many times as you need this school year. Save time and save money with EasyKicks! My First Experience At Planet Beach Kingwood & Get A FREE Service Of Your Choice!